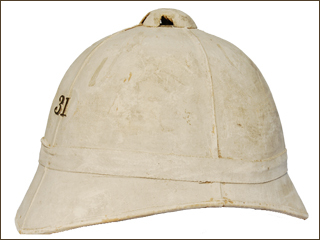 Based on the British Foreign Service Helmet, the American Army adopted their own sun, or pith helmet in the early 1880s as part of new efforts to provide a summer uniform. Despite rumors that these helmets were British made. 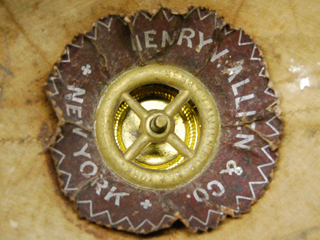 This example was produced by New York based Henry William and Company, and may have been an early prototype. It features the number 13 on the front, which is likely a New York National Guard Unit. It features a very pronounced pointed visor. 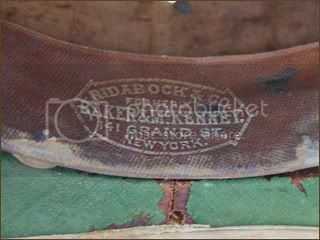 This example was produced by New York based McKennedy and Company, and may have been an early prototype. It features the number 31 on the front, which is likely a New York National Guard Unit. 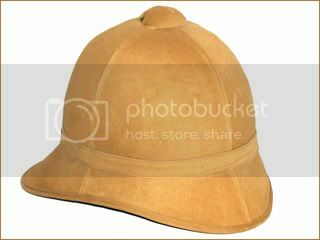 This model features a more rounded visor than the Henry William version above, but still more pointed than the Ridabock model below. 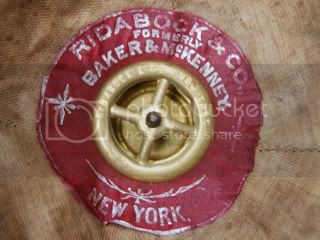 This helmet is the New York National Guard variation made by Ridabock & Company, formerly Baker and McKenney. 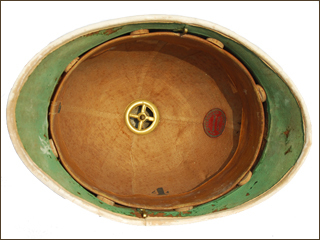 This example features the side ventilation that was popular with state national guard helmets, but also used by the regular U.S. Army. The visor on this helmet is very rounded compared to the two above models. This helmet, based on the Model 1880 helmets was made by Ridabock & Company, and is believed to have been a late era (1950s or later) bandsman helmet, and has the characteristics of the helmet used in the movie Stars and Strips Forever. 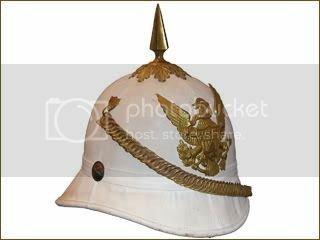 Following the success of the Prussian Army during the Franco-Prussian War (1870-1871) many nations including the United States began to use spike helmets. 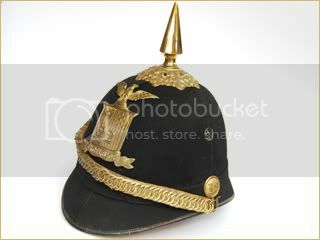 These were modeled after those used by the victorious Prussian, and united German Armies. 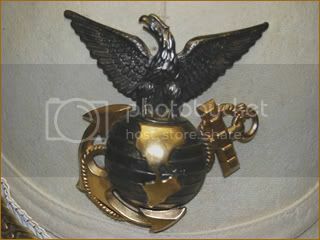 Typically American helmets were dark blue and used as part of a dress uniform rather than on daily active duty. 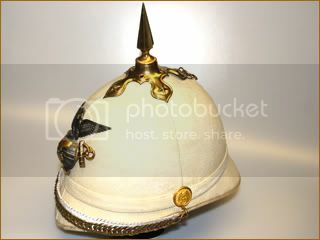 However in the summer many American units from around 1880 to 1905 used European style pith helmets in warmer areas. While these white helmets were never officially issued with brace accoutrements, many officers applied their dress spikes and front plates. This practice was officially banned by 1905 when the American army redesigned their uniforms. 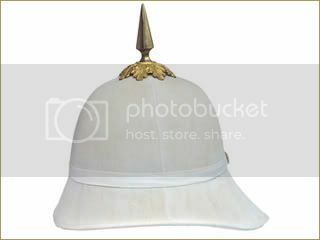 Infantry, cavalry and artillery units in the Indian Wars and then during the Spanish American War used this white type of pith helmet. This particular example features the front plate of the 4th Artillery. 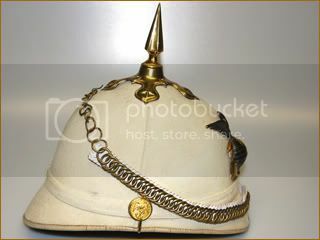 The widely produced Model 1887 American sun helmet with dress spike. Despite rumors that these helmets were British made, these helmets were produced in large numbers by Horstmann Brothers and Company of Philadelphia, a well-known dealer and manufacturer of military uniforms. 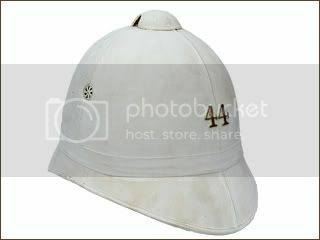 This summer cork helmet is made to the post 1889 specifications with khaki cotton over the cork body. 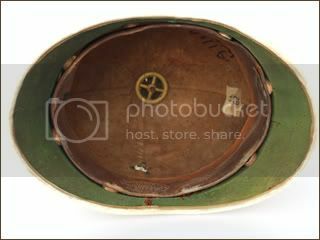 This model helmet was used by the US Army in the Spanish American War in Cuba and in the Philippines. These helmets were used as late as 1909, before being taken out of service. 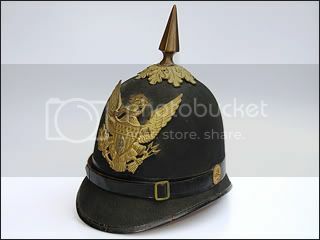 Following the Prussian victory against France in 1871 the United States authorized for wear a uniform that included a dark cloth spiked helmet. 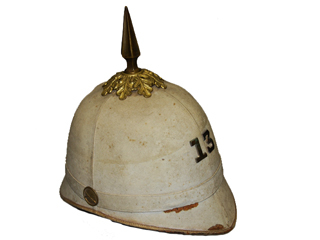 This helmet pattern was used throughout the latter part of the 19th century. This pattern was actually modified in the mid-1890s, but the regulations were not officially updated until 1902. Thus this is known as the 1902 pattern. 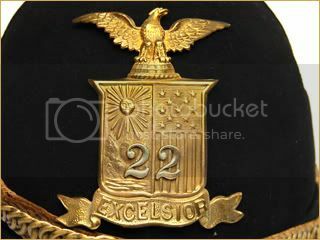 This particular example is of the 1902 pattern and it features the badge of the second artillery. 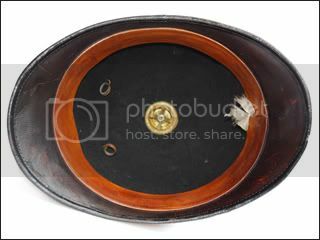 It is dated 1898 and was likely made by the Horstmann Company. This particular example is based on the 1902 pattern for the army, and was used by the New York National Guard. It features the distinct NYNG bade on the front, along with engineer side buttons for the particular National Guard Engineer Unit. 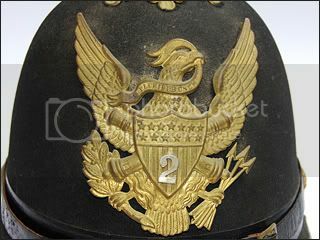 It is worth noting that this National Guard version of the 1902 pattern helmet features the same unique side ventilation as the white summer helmet pattern.